The 12th match of PSL 2018 takes place with Lahore Qalandars meeting Islamabad United. Both teams are at the bottom of the table, with Islamabad looking slightly better with one win as opposed to the Qalandars’ three losses out of three matches. They will desperately need to win this match to get back into the groove. It is a must-win match for both teams. This team is not new to being at the bottom of the table. They have been there for the past two seasons. They really should not make a habit out of it. Brendon McCullum, the former NZ captain, continues to hope to bring a change in terms of luck for this team. The team needs to work on both the batting as well as the bowling department. This team really needs to take a 180-degree turn about and take a look at themselves from the scratch. Individual players performance wise, there are a few you can have in your fantain fantasy lineup. M Rahman is known to take wickets to give the team a much-needed breakthrough. Yasir Shah too. He has a decent economy rate as well. Sunil Narine took two wickets in the last match, He can be relied upon. Especially since he can also contribute with the bat on a good day. Batting wise, Brendon McCullum can make a big difference to the team when he clicks. But the problem is when he runs out of partners to stay with him until the end. Fakhar Zaman needs to step up and save his team from drowning as well. Sohail Khan came in instead of Raza and took wickets. From the batting side, Luke Ronchi along with captain Misbah Ul Haq can be in your fantain fantasy team. JP Duminy is obviously a good one. He comes with experience and form. Hussain Talat too has his moments. These three players make for a good batting attack. If they click at the same time, nothing can stop the team from winning. 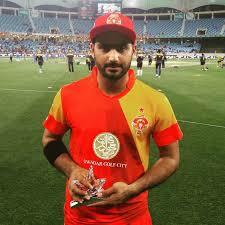 Rumman Raees is the bowler you need. M Sami has proven to be worth it as well. They did defeat Multan Sultans, who defeated the defending champions. Note: Rumman Raees is out injured. He is out for the next two matches. Gohar might get his chance.